According to recent research at the University of Iceland, direct contribution of the aluminum industry in Iceland has been around 2.9 percent of gross domestic production (GDP). This is the average percentage for the period 2007-2010. In this period, the contribution reached its maximum in the year of 2010, when it was 4.6% of GDP. In her theses towards a MS degree in Economics at the University, Ms. Anna Guðrún Ragnarsdóttir describes how the aluminium industry has had a major influence on Iceland’s economy. The author explains how the aluminum industry can be divided into three different categories, regarding its contribution to the Icelandic GDP; direct contribution, indirect contribution and demand effects. The industry’s total contribution to the Icelandic GDP was calculated as the sum of direct and indirect contribution. The demand effects were not estimated in the thesis. The direct contribution of the aluminum industry is estimated using a data set from Statistics Iceland. Estimating the industry’s indirect contribution was more complex. The aluminum sector now consumes almost 75 per cent of electricity generated in Iceland. When taking this part of the Icelandic energy industry into account, the total contribution of the aluminum industry to the Icelandic GDP is somewhat larger than the direct contribution, and the total contribution can be said to be 5.4-6.3 per cent annually (on average in the period 2007-2010). In 2010 this number was approximately 7.7-8.6 per cent. 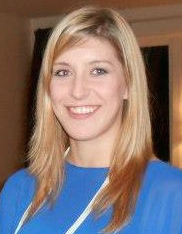 In her thesis, Ms. Ragnarsdóttir explains how aluminum production first began in Iceland in the year 1969, with an output of barely 11 thousand tons annually. In the early 1990s the rate of production grew rapidly and today it is around 820 thousand tons annually. Two of the largest hydroelectric power stations in Iceland were constructed mainly to serve the aluminium industry. According to the thesis, the industry generates in total around 4,000 jobs in the country. However, almost all the aluminum products manufactured in Iceland are exported. Today, the aluminum products have approximately a 40 percent share in the total export of goods from Iceland (which is more or less the same proportion as that of fish products). Iceland is experiencing increased interest from companies overseas for hosting their data in Icelandic data centers. Recently, Advania signed an agreement with Opera Software for the expansion of its operations in Advania’s green data center in Iceland. Advania is a leading Nordic Information Technology (IT) company and owner of Thor Data Center in Iceland. This new agreement continues the ongoing buildup at the data center with a near doubling of Opera’s current capacity. 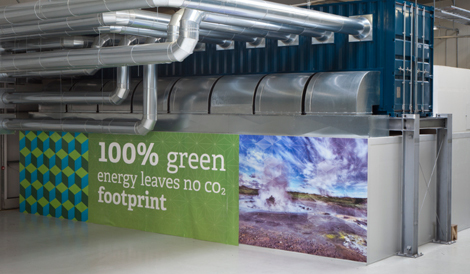 Advania’s data center is arguably one of the world’s greenest data centers as all of the energy used at the site is generated from renewable sources and less energy is used for cooling due to the natural cool climate in Iceland. Opera Software uses the data center to facilitate web browsing for more than 230 million Opera Mini users around the world. Already more than half of Iceland’s Internet traffic runs through the Advania Thor Data Center, and this expansion is set to increase this traffic even further. Opera Software was one of the first companies to seize the opportunity represented by Iceland’s affordable green energy and free cooling. 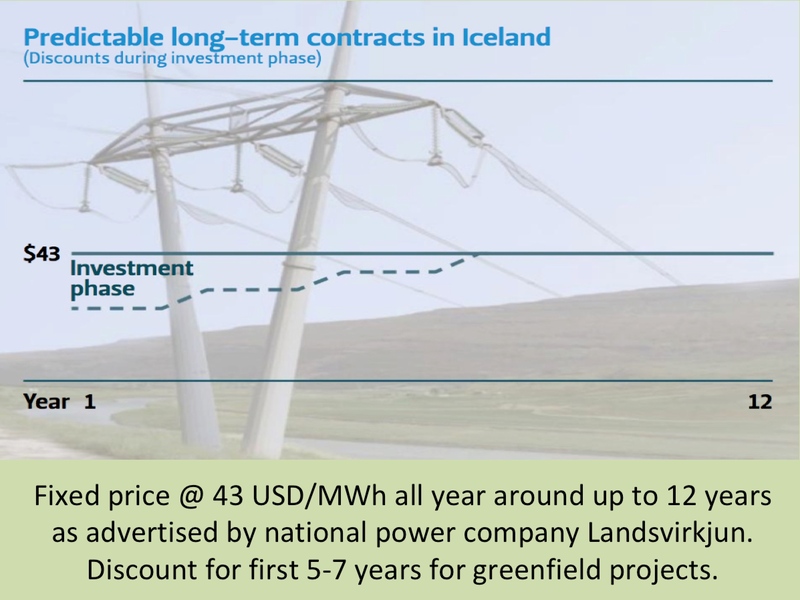 This allows for an extremely efficient operation while still maintaining harmony with the environment since there are no carbon emissions from Iceland’s energy production. You can read more about how data centers in Iceland offer dramatic savings here. The countries of the Nordic region (Denmark, Finland, Iceland, Norway and Sweden) have much lower Greenhouse Gas (GHG) emissions per capita than some other Western countries. However, the Nordic countries have higher GHG-emissions than many other industrialized countries in Europe. One of the main reason behind somewhat high emissions in the Northern countries, is the extensive energy-intensive industry in some of them. Finland and Sweden have a large paper- and pulp industry, and Norway and Iceland have extensive aluminum industry (resulting from historical low power cost, from utilization of hydropower). In Iceland, emissions from generation of electricity and from heating are very low owing to the exclusive use of renewable energy sources (geothermal and hydropower). Still, Iceland’s per capita GHG-emissions are the highest in the Nordic region. Almost 80 per cent of the GHG-emissions stem from transport and fishing vessels. Process emissions from aluminium production plants have the most significant impact on emissions after transport. 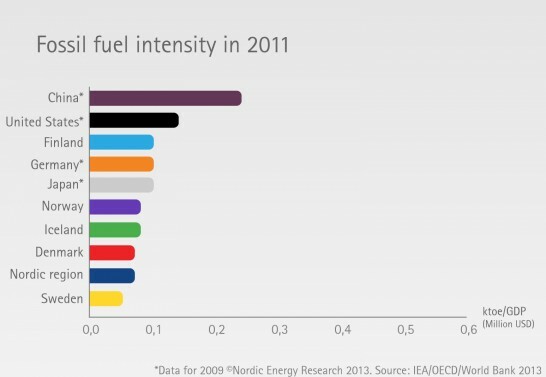 Fossil-fuel intensity is another interesting measurement. It tells us how much fossil-fuel energy it takes to create one unit of GDP. In this measure, China and the US are relatively fossil fuel intensive. The Nordic countries are well ahead of many other economies in their fossil fuel efficiency due to their high utilization of renewable energy. Iceland has a significantly lower fossil-fuel intensity than energy intensity, reflecting its abundant renewable energy sources, utilized both for electricity generation and heating.